If you’re a teacher who has worked in Illinois, you have some special challenges when figuring out your potential Social Security benefits. Whether you are a new teacher working on a long-term financial plan, or an experienced educator preparing for an imminent retirement, it is important that you understand how your teaching pension impacts your eligibility for Social Security benefits. Under Illinois law, teachers in Illinois contribute to the Illinois Teachers Retirement System (TRS), and their earnings from teaching are not subject to Social Security taxation. If the teacher has never worked outside the Illinois teaching system, the result is simple. The teacher receives a pension from the TRS, and does not receive Social Security benefits. However, over the course of a lifetime, most teachers have non-teaching employment. This may include jobs while in school, summer employment, careers before or after teaching, or time teaching in states that contribute to to the Social Security program. This non-teaching employment usually pays into the Social Security system. If there has been enough non-teaching employment, the retiree may be eligible for both a TRS pension and Social Security retirement benefits. There are two rules that apply here: the Windfall Elimination Provision (WEP) and the Government Pension Offset (GPO). Both the WEP and GPO impact the retirement benefits of Illinois teachers. Simplified explanations of each law are listed below, and the links above give more detailed information about each rule. In general, Social Security benefits are determined by multiplying average earnings by a certain factor. For those who have non-Social Security pension income, the WEP reduces the factor by which average earnings are multiplied to determine Social Security benefits. For Illinois teachers, this can mean that they have a substantially lower Social Security benefit than they anticipated. The reduction may be no more than one-half of the government pension to which the person is entitled in the initial month of entitlement to the pension, with a cap of $428 reduction for those who begin receiving benefits in 2016. If you have substantial work experience outside the TRS system, you may not be subject to the WEP. The reduction is phased out for workers with 20-29 years of substantial Social Security covered earnings, and is eliminated completely for employees with 30 or more years of substantial covered earnings. This phase-out is important, and may impact career choices for those who are close to the important 20 and 30 year levels. This particularly includes teachers who worked a long non-teaching career prior to becoming a teacher. In some situations, even an additional year or two of non-teaching employment can have a significant impact on overall benefits. It is very important to understand that if you are eligible for a pension through the TRS, the Social Security account statement that is available online will probably generate inaccurate benefit figures for you. The online account statement provided by the Social Security Administration does not account for reductions in benefits due to the WEP. If all of your paid employment was covered by the Illinois TRS, the WEP does not apply to you, as you are not eligible for Social Security benefits. -Are entitled to a Social Security survivor benefit. The GPO reduces Social Security survivor benefits by 2/3 of the recipient’s public pension, and may reduce Social Security benefits to zero. Therefore, if you are eligible for a $1200 public pension each month, and a $1200 Social Security benefit each month, your Social Security benefit would be reduced by $800 (⅔ of $1200) to $400 monthly. 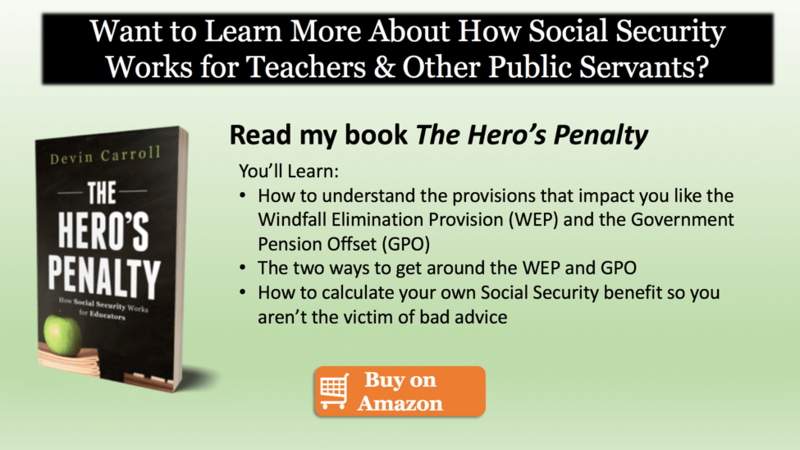 Illinois teachers need to understand how the WEP and GPO will impact their retirement benefits. I’m here to help! Send your questions to devin@socialsecurityintelligence. I’ll answer your questions privately, as time allows, or publish them anonymously on my blog so that the answers can benefit a wider audience. You may also find this video helpful. If you have thirty years of more of “substantial” earnings outside of your non-covered work (work where you didn’t pay into SS), the Windfall Elimination Provision will not apply to you. You’ll need to go back and check your earnings to see if they met the definition of “substantial” or not. You can find that list at https://www.ssa.gov/pubs/EN-05-10045.pdf .